In the beginning our tower construction was a single model called ”The Vargarda Tower”, more than 40 years ago. Now its designation is ”M38W”. It is all the same since then! Anyone may think a bad construction would not survive such a long time. Correct. But a good construction will. And do. Our M38W tower is one of its kind. ”M” stands for the first letter in Swedish for Tower (Mast), ”38” stands for the side width (38 cms) while the ”W” is the shape of the corner legs. Today we have M25W, M38W, M65W and so on. 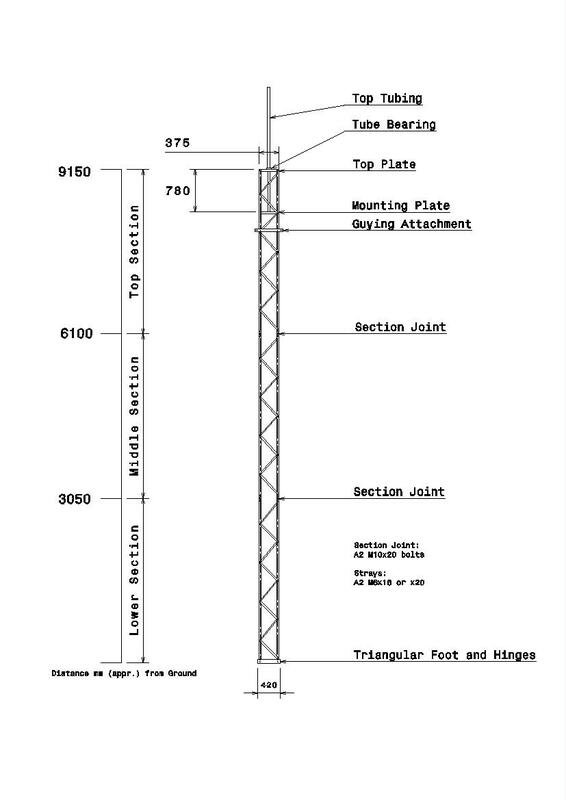 The M38W is made as triangular 3 meter sections easy to put together to get the tower needed. 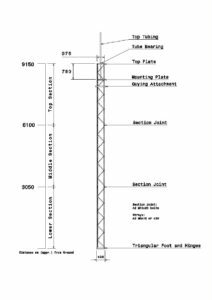 Large towers are available up to a hight of 100+ meters although most common are 6 to 30 meters while erecting will be quite easy due to the low tower mass. Main ower parts are Lower Section, Middle Section and Top Section. The amount of Middle sections included rules what large the tower will be. The weight of one section is approximately 15 kg’s. The low mass makes the M38W well suited for Roof mount. Despite the fact the M38W is available as a complete kit our customers tend to ask us for ready sections as labour work may be more efficiently used at theirs. A kit craves some time to spend and efforts to complete. The included assembly instructions are very straight forward and easy to follow. Pictures tells a lot. When we are questioned by our customers what time is needed for a kit, we tell ”anyone never done a section kit assembly before will need about 4-6 hours while the experienced assembler suffice with one hour”. Hence, a complete 9 m M38W delivered may be completely assembled and erected onsite within one labour day onto a preworked tower ground base. Assembly is by means of bolts 6 mm and 10 mm sizes in Stainless Steel. The tower Aluminium is the strongest available, alloy 6082-T6. Well enough, an M38W tower will easily withstand harsch environment close to salt water, or even in it. The M38W need guyings above 12 meters. An 18 meter tower is good with one guying level. Above 21 meters two guying levels will suffice; 9 m and 18 m. Above 21 meters a new guying level is set at each another 9 meter. Tower statics are available at delivery if requested for as well as drawings of the parts included. M38W accessories include different parts like Top Tubings, Booms, Side Attachments, Holders, Tube Crossings and so on. Even specially designed parts are available at request. The M38W may be equipped with a specially designed Sleigh. Reaching the top may to some applications be needed rather often why a way to easily elevate equipment from top down to ground and up again is extremely handy. This Sleigh moves along the tower all the way from lowest at ground level to the top.